Hi, there crafty friends, LeeAnn here today with a project not so easy for me to make. This is a Mother's Day card that I will be taking to the Cemetery on Mother's Day, to give to my mom. Mother's Day is 2 days after what would be my mom's 72nd birthday. I used the Bear Love and Always Pick You sets for this project. 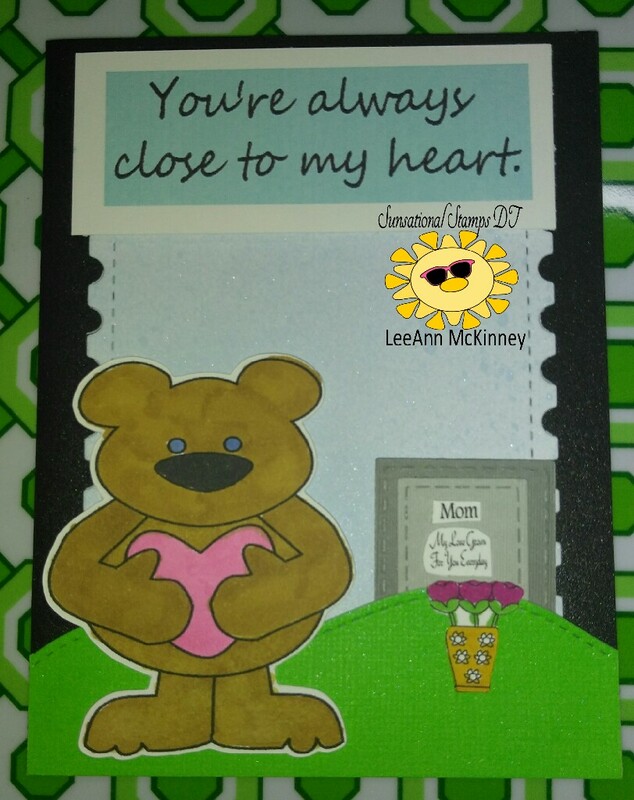 First I printed the two digital sets in the desired size, I then used my Scan N Cut to cut the Bear and a set of the flowers. I then used some rectangle stitched dies to cut out the tombstone layers, and a hillside stitched to cut the lawn. I used a postage stamp die to cut out the background later. I used Summer Sky "fireworks" spray from Imagine Crafts to spritz the background. The sentiment is from the Bear Love set and I used MS Paint to size it properly, color the background and then printed. I used my Spectrum Noir alcohol markers to color the bear and flowers/vase. At this point, I used Kaisercraft double stick tape to adhere the background, hillside, and bear. I used my Xyron X to adhere the smaller stone cut to the larger as well as the little sentiments and the flowers. I used dimensional foam to adhere the tombstone and the sentiment and my project was complete. I hope you have enjoyed this project. Please come back tomorrow to see what Shylaa has made for you. Please be sure to follow our blog.